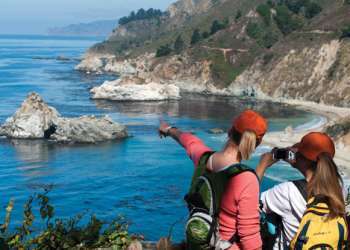 The Monterey Beach SportsFest is a two-day festival celebrating the ocean lifestyle on Monterey’s Del Monte Beach, nestled between downtown Monterey and the Monterey Bay National Marine Sanctuary. Participants and spectators will be inspired to care for the ocean as they directly connect to it through the athletic events in and adjacent to the sea, and through interaction with the educational and conservation resources available at the two-day “Healthy People, Healthy Oceans” Expo. There are plenty of activities on both land and sea to keep elite and amateur athletes at bay. Sporting events include open-water swims, beach volleyball, ocean water polo, and a sand castle contest for kids. On Saturday, the Monterey Beach SportsFest will also host a free movie night on the beach with cake and popcorn. “The Healthy People, Healthy Ocean” Expo invites competitors and spectators to learn from wellness experts as well as leaders from ocean-related groups. The Expo features several booths located between The Wharf Marketplace and Del Monte Beach on Saturday and Sunday. Registration fees vary and each includes an event shirt. Swimmers will also receive a swim cap to use during the event. Full Information on registration for the various sport competitions can be found at the official website. Several hotels are conveniently located in downtown Monterey and walking distance to the event including the Portola Hotel & Spa, Monterey Marriott, and Hotel Pacific.